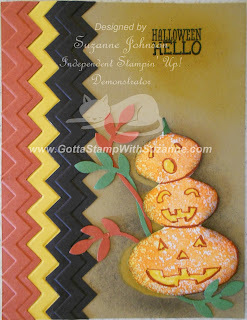 GOTTA STAMP WITH SUZANNE JOHNSON: JACK O LANTERN STACK HALLOWEEN CARD! JACK O LANTERN STACK HALLOWEEN CARD! When is a snowman a Jack O Lantern? When you think outside the box using a Stampin' Up! stamp! My stack of Jack O Lanterns was stamped with Pumpkin Pie ink and the snowman base stamp image from the Snow Day set in the Holiday Catalog. I sketched the mouths and cut them out along with free-hand cut bits to use as masking pieces for the faces. I inked the stamp, lay the pieces on it and pressed them down gently (use a tool such as tweezers or a pencil tip) to lift off the ink, huffed on my inky stamp & stamped on Whisper White cardstock. I colored in those areas with a Crushed Curry marker, then outlined with Cajun Craze. I used part of the carrot nose from the same set to stamp the stem with Garden Green. After you stamp and color your pumpkins, cut out the stack and sponge the left side with Crushed Curry, the right with Cajun Craze (lightly) and then sponge black on the edges. In my second photo you can see how I used masks to sponge my Baked Brown Sugar card base with Crushed Curry and Basic Black, as well as how I layed out my Bird Punch punched branches of Garden Green and Cajun Craze. The pumpkins are adhered last with Dimensionals. The border is made of strips of Cajun Craze, Crushed Curry and Basic Black that I texturized on the Big Shot with the Chevron Embossing Folder, then trimmed to layer together. The sentiment is also from a Holiday Catalog set: Halloween Hello, and it is embossed with Black embossing powder and sponged with Crushed Curry ink. To create the background for the pumpkins, stamp and cut out a copy of the snowman base image on scrap paper so that you have TWO masks (the shape and the negative shape or outline left after you cut out the shape). Position the shape cutout where your pumpkins will go and sponge black ink around the cutout mask with a light-handed daubing application to get a textured look in your sponging. Switch to the negative space mask and use a rubbing application to sponge Crushed Curry ink on the left hand side of the shape area you created with the black ink. Please become a fan! Subscribe & follow my blog! MY DIGITAL STUDIO TOOLBAR IS BACK & BETTER! LNS FALL TREASURE HUNT LIST UPDATE! LNS FALL TREASURE HUNT BLOG LIST UPDATE! THE NEW ENVELOPE PUNCH BOARD IS HERE! Click button below to shop online. Specify SUZANNE JOHNSON as your demo to get best prices. Click here to download the CURRENT CATALOG PDF or click the Shopping button above to go to the online store! CLEARANCE RACK - SHOP & SAVE! While supplies last - click to shop now! CHECK OUT WHAT IS NEW! My Pinterest name is "ROSEStampers"
My customized template design was selected! My "Finch Frenzy" page was picked for this challenge! Click the badge to see the MDS Monday post! Click the badge to see where my butterfly card was picked for the MDS Monday Challenge! 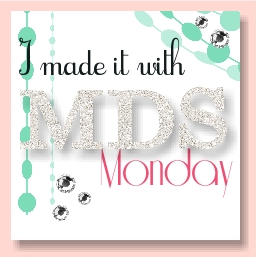 I was picked for this MDS Monday Challenge! My fellow demo Josee shared my banner card! 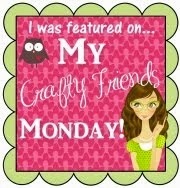 This is the personal blog of Suzanne Johnson, an Independent Stampin' Up! Demonstrator in Washington state. I am responsible for its content and Stampin' Up! does not endorse the use of or contents of the classes and services I may offer here.